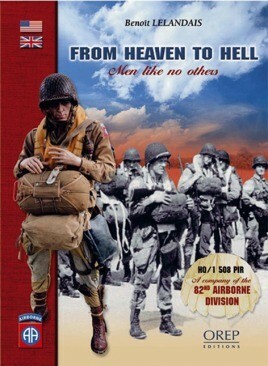 This book recalls the story of 135 Americans grouped together in a company of paratroopers of the 82nd American Airborne from their enlistment to the end of the Battle of Normandy. Throughout this book, you will discover what stirred them to enlist in this new force, yet unknown even in America : the paratroopers. Unfortunately, due to sales rights restrictions, we cannot offer From Heaven To Hell for sale in your country. This book recalls the story of 135 Americans grouped together in a company of paratroopers of the 82nd American Airborne from their enlistment to the end of the Battle of Normandy. Throughout this book, you will discover what stirred them to enlist in this new force, yet unknown even in America : the paratroopers. After the psychological shock provoked by Pearl Harbour on 7th December 1941, this unit, like many others, was created from nothing. You will share with these men their daily life during their military training in the United States through their own accounts, most of them published here for the first time, as well as their life in England in early 1944 whilst awaiting operation 'Overlord'; a plan which was kept secret to the very last minute, even from the paratroopers. Through original accounts, you will take part in the final preparations on the airfield tarmac at Folkingham, in England just before they boarded the C47 aircraft. You will board with them onto the nine C47's assigned to their company, from lift-off to the great night jump onto drop zone 'N'; somewhere in the middle of Normandy among German flak fire. You will take this jump with them, which was the first for almost all of the paratroopers, and alas, the last for many. You will take an active part in the regroupment attempts on the 'high spot' of &'Hill 30';. You will stay with them until the 12th of July 1944, date marking the end of the Battle of Normandy, at a cost of many deaths and casualties. You will understand the organisation of a parachute regiment, a battalion command company and an air transport group during the Battle of Normandy. This book is far from a trivial official report. It is the human testimony of simple soldiers, many of whom have awaited their old-age before telling their tale, for they simply didn't have the strength to tell it earlier. Certain veterans mentioned in this book have deceased before its publication, but the account of their achievements will live on in history.